Crochet your own dishcloths with these easy crochet dishcloth patterns! 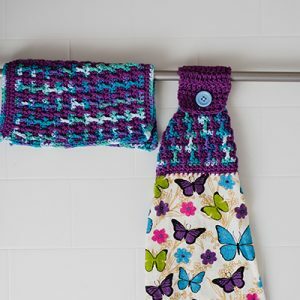 See how easy it is to keep your kitchen clean and orderly with these simple crochet patterns and always have some cloths on hand to deal with any unexpected messes, big or small! 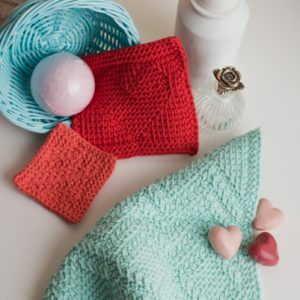 Crochet dishcloth patterns can be very easy to make and completely beginner-friendly by using a simple stitch pattern and one solid color throughout. You can always add some flair by mixing in multiple colors or by trying your hand at a more complicated stitch pattern – in fact, these dishcloth patterns are a perfect way of practicing new stitches! 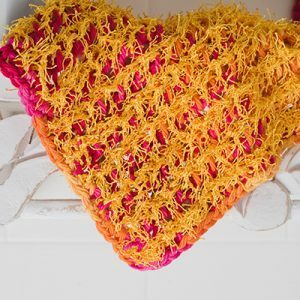 Try using special “scrubby” yarn in order to give your crochet dishcloth patterns that tough grit they need to bust through the toughest caked-on messes. 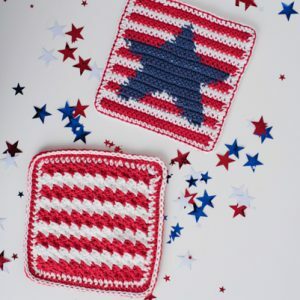 This patriotic striped dishcloth is worked in rows of slanted shells in red and white. The border consists of a row of single crochet, then a row of half double crochet and finally a row of slip stitch. 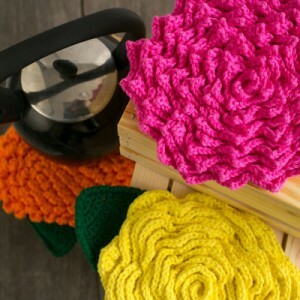 This set of three flower hotpads is a beautiful addition to any summer table. Use them to protect your table from hot dishes or simply as lovely centerpieces. Made using cotton yarn in bright colors, they’re both functional and pretty! Turn your kitchen into “a daisy a day” using the nostalgic look of denim. 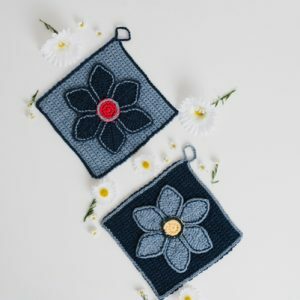 These delightful potholders make for a great conversation piece for friends and guests. This set is a great gift for your favorite Galentine. Include her favorite soap or body wash and you have the perfect gift. This is a three-piece set made using Tunisian crochet. This is an excellent technique to use when making washcloths because the stitches hold well wash after wash. 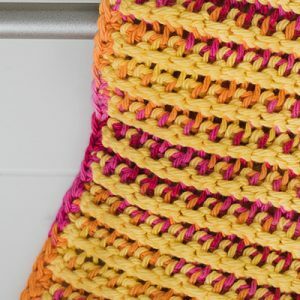 Using a double-ended crochet hook, create a cheerful kitchen towel, then display it with either the mango yellow side or bright strawberry side showing. You’ll love the amount of cheer this adds to your kitchen décor! Use a double-ended crochet hook to create a dishcloth that does double duty. One side features a scrubby yarn, while the other side features soft cotton for when a gentle wipe is all that is needed. 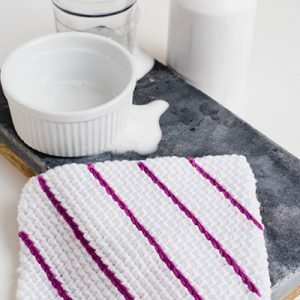 This dishcloth is worked in the round to make a practical double-thickness that holds up well to many dishwashing sessions; plus, the added texture helps to scrub away grime and dirt. Fun diagonal stripes are top stitched for a finishing touch. 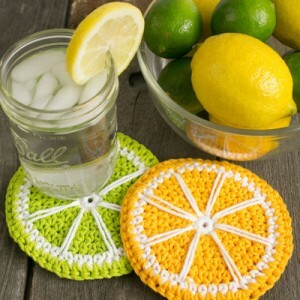 Nothing says summer more than a lemonade stand, so refresh your memory of lazy summer days past with these adorable coasters. Mix it up by using orange yarn for orange slices or pink yarn for grapefruit slices and brighten up your breakfast table. Worked in single crochet rows following a chart for the color changes, you’ll be able to practice your tapestry crochet technique using this beautiful pattern. Carry the second color across the blue stitches as done in tapestry crochet technique.